Square Enix's Collective gives users the ability to vote on games that will earn the company's support. Square Enix announced today that its crowdfunding initiative, Collective, is officially up and running. Announced last year, Collective will give gamers the ability to vote on whether or not they would crowdfund selected games. If a game can, in turn, earn enough support, its developers will be given the option to start an actual campaign via IndieGoGo, after which Square Enix will offer to distribute them if they reach their funding goals. 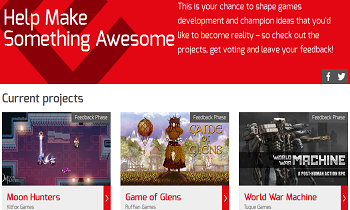 The Collective has launched with a selection of three games for users to vote on. The first is Moon Hunters which features nifty "hand-panted pixel art" and is described as "an open-world adventure for 1-4 players" who will be tasked with "solving ancient mysteries." Following up on that is World War Machine, an action RPG set during a futuremachine civil. It will supposedly include highly customizable weapons and gear for players to tinker with, as well multiplayer cooperative gameplay. Finally, Game of Glens, which is being made by Crackdown 2 developer Ruffian Games, will be a lighthearted game about Scottish highlanders competing against each other in games that involve tower construction, catapults and, apparently, flaming cows. While this does arguably seems a tad similar to Steam Greenlight, we will say that we're intrigued by the notion of games going through a vote before launching crowdfunding campaigns. If nothing else, perhaps Collective will be useful as a barometer of interest that participants can look at to help ready themselves for the competitive world of asking for people's money. Of course, if things go well, the end bonus of distribution support from Square Enix also couldn't hurt.